This 3/8” wide chain is a wonderful way to showcase a focal bead or pendant. It works up quickly and has a nice drape and smooth feel around your neck. Accent beads: Red sample shows 6mm Bicone crystals. Grey Sample shows 6mm fire polished rounds. 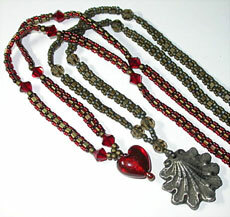 Focal bead or pendant: Red Heart 13mm, Pewter Pendant 21mm.